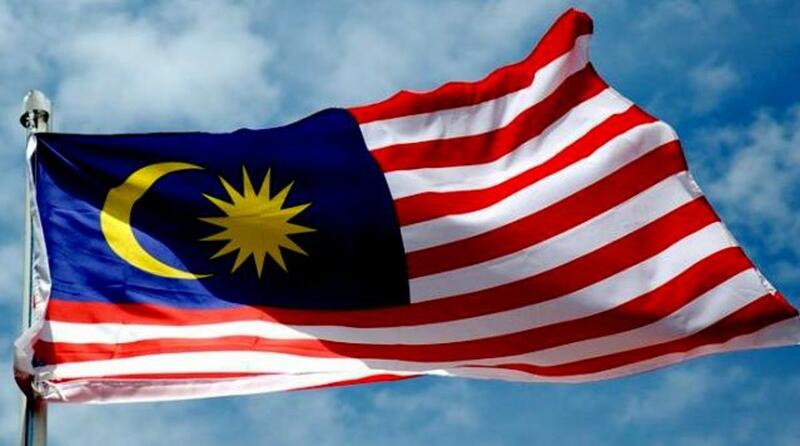 Malaysia is a multi-ethnic, multi-culture and multi-religion country where the heterogeneity of its people co-exists in peace and harmony. Although predominantly a Muslim country, it has a large Buddhist, Christian and Hindu populations. These melting pots of races, religions and cultures create a diversity that enriches our country's cultural lifestyle. What makes it even more exciting is that, Malaysia acknowledges the religious and cultural festivals of these various ethnic groups. Hence, with these diversities, the country's calendar is filled with several colorful religious and cultural holidays. Some of these are declared national public holidays, some are public holidays in certain states only, while some are not. So let me share with you, our long lists of festivals, celebrations and major events that are held annually in our country. Who knows, you may want to come over and experience them yourself. To kick off the year, Malaysians will join New Year's countdown parties not just at homes, hotels and clubs, but also at major shopping malls and landmarks. One of the biggest celebrations that draw the biggest crowd is held at KLCC Park, just outside the Petronas Twin Towers, in Kuala Lumpur. Here you will get the biggest and most impressive fireworks display that can rival any major fireworks displays from other parts of the world. Fireworks at the Dataran Merdeka, also in Kuala Lumpur, are just as imposing. 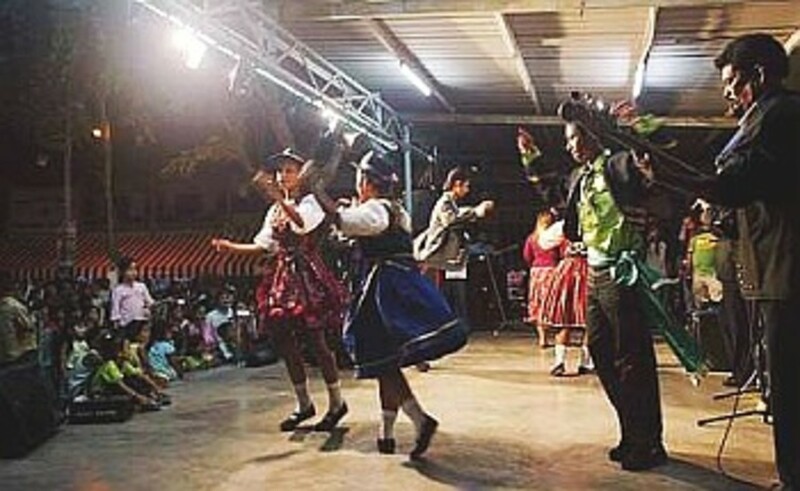 These celebrations include live stage setup for cultural dances and music by local and international artists. 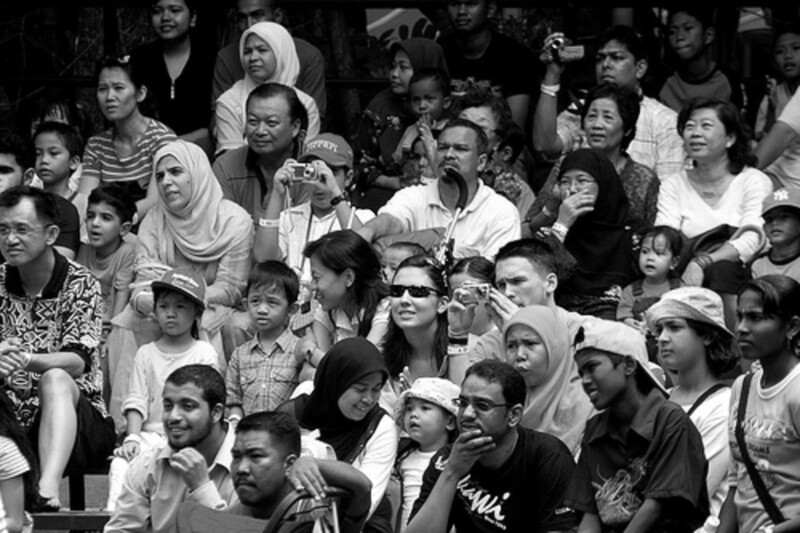 Typical of most Malaysians, eating is another activity during this event and the eating, drinking and partying will spill out into the streets. However, it is not just party and fireworks for New Year; some organization such as Sri Narayani Foundation will welcome the New Year with prayers for peace and prosperity. If you enjoy sailing, this annual event held on the island of Langkawi, in the northern part of Malaysia, is a must do. 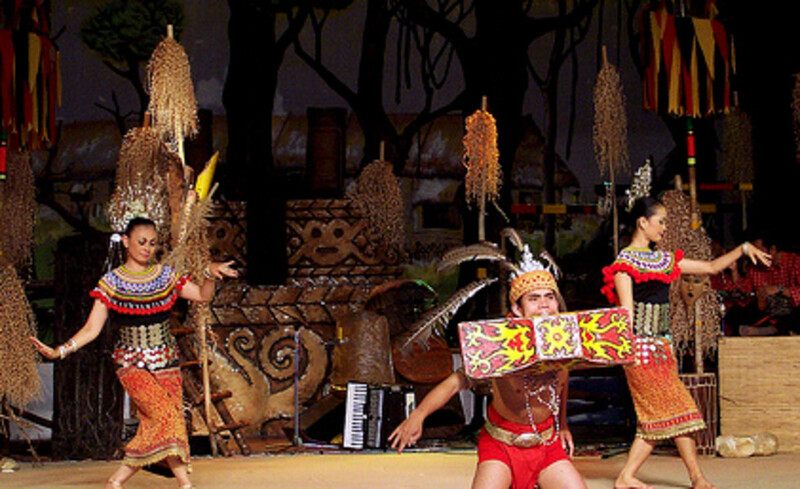 Langkawi is an archipelago of 104 islands in the Andaman Sea and provides a spectacular backdrop to the whole event. Coupled with its excellent weather and good wind condition, and warm tropical waters, this Royal Langkawi International Regatta has become the premier sailing event in Asia. The event attracted over 40 sail boats from over 12 different countries, in 2013 and the organizer expects more will be participating in the coming years. The first religious festival for the year is Ponggal, an Indian Thanksgiving festival practiced by Indian Tamil to celebrate a good harvest. They will offer their prayer to Sun God, farm animals and the weather, for giving and helping in the harvest. Although this may not be the actual situation now, they still practiced this religious festival as part of their cultural heritage. Ponggal is celebrated over a four-day period, the highlight is the Ponggal cooking ceremony of boiling milk, and rice until it overflows. 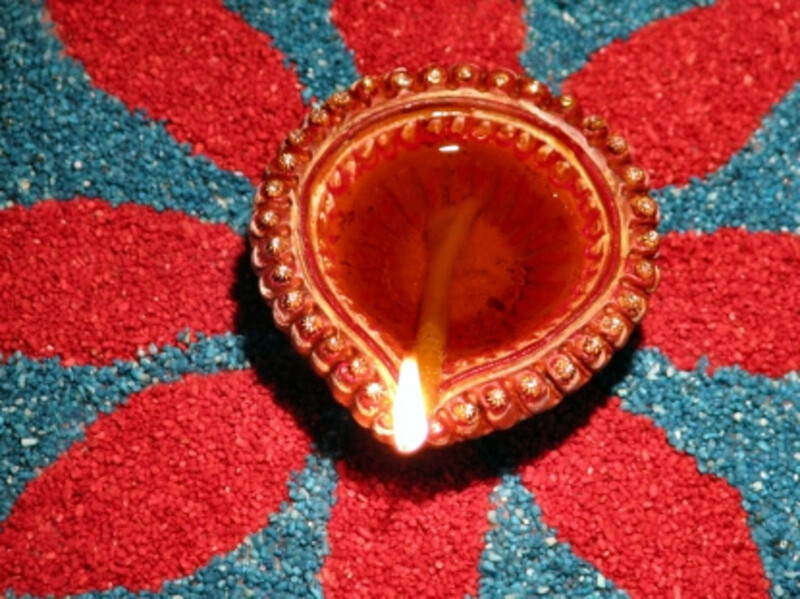 This symbolizes wealth and good luck. As part of the celebration, they will decorate the homes with banana and mango leaves. They will also adorn the floor with ornate patterns drawn using colored rice. Read more here. 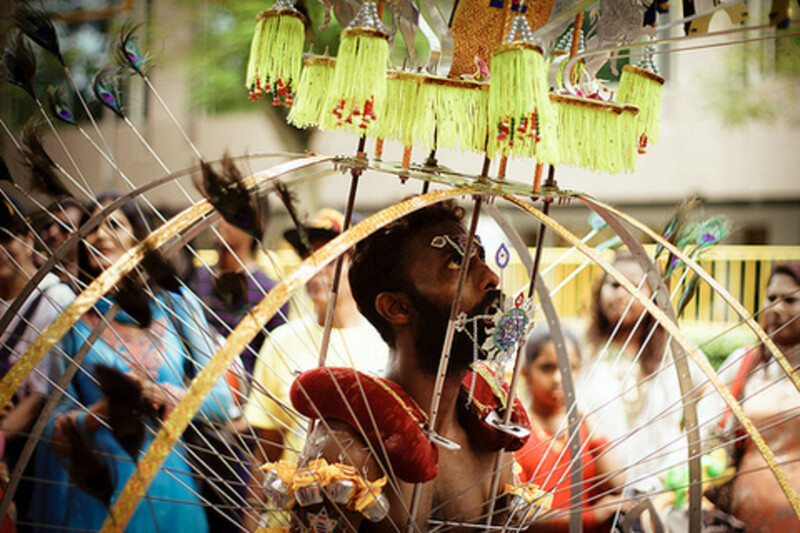 Thaipusam is probably the most colorful, spectacular and intense religious ceremony in the world. Celebrated by Tamil speaking Indians, Thaipusam is a Thanksgiving festival to one of their Gods, Lord Murugan, for prayers answered. They will show their appreciation by carrying kavadis fixed to their bodies by hooks and other sharp metal objects. They may also insert these metal spikes through their tongues and cheeks. It looked bloody and painful, but the devotees had to go through strict diet and meditation before the event. Hence, they don't feel any pain and during the event, they are also in a spiritual and devotional trance. This much photographed festival is held in the last week of January or early February depending on the planetary calculation for that year. Watching the event live is more exhilarating than watching them on Discovery Channel. This is one festival that you must see and experience at least once in your lifetime. Read more here. The Chinese is the second largest ethnic group in Malaysia and Chinese New Year is, therefore, a major festival in the country. It is celebrated either in late January or early February, depending on the lunar calendar. Traditionally, family members are expected to be home at their parent's house for family reunion dinner, prayers and offerings. In preparation for this big day, house will be cleaned and decorated with auspicious symbols. Chinese New Year meal will include the customary dish, Yee Sang, eaten only during this celebration period, and only in Malaysia and Singapore. Families will have open house, not just for visiting relatives, but also for friends from various ethnic groups. This open house practice is also done by corporate organization as a way of saying thank you to their clients and friends. This practice is unique to Malaysia, but has now spread to neighboring countries. Red ang pow packet with money inside will be given by the elders to children and unmarried family members. To bring luck and prosperity, some family will have lion dance performed at their homes. 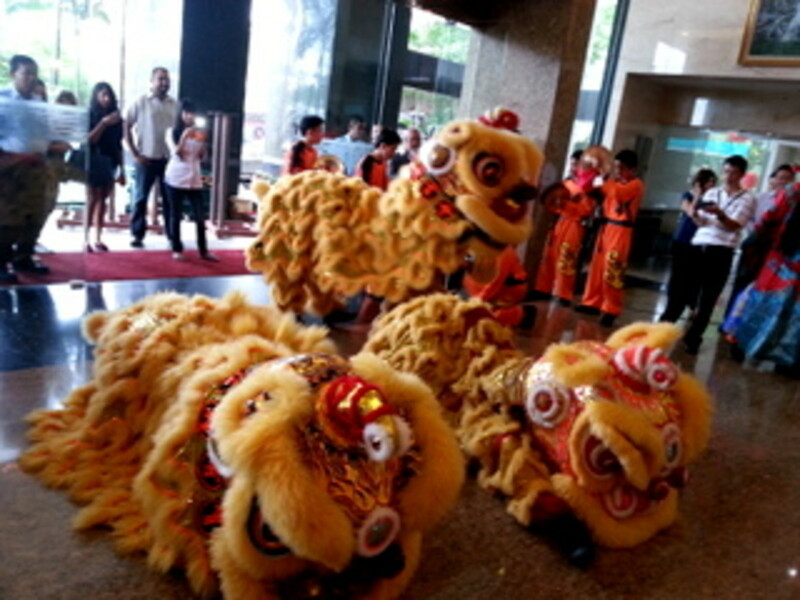 Companies will also organize similar lion dance at shopping malls and offices. Read more here. 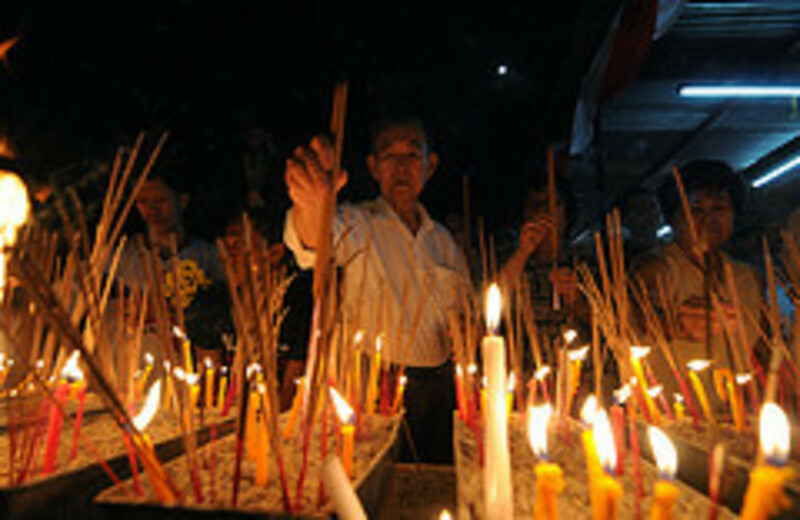 Chap Goh Mei is celebrated by the Chinese with prayers and offerings to mark the 15th night of Chinese New Year. It also marked the last day of this lunar New Year. In China, it is known as the Lantern Festival and houses will be decorated with lanterns made in various shapes, the most popular being shape of animals. Chap Goh Mei is sometime called the Chinese Valentine's Day as on that day, young unmarried woman will throw oranges into the sea or river in the hope of finding a good husband! February is packed with religious festivals and celebrations. Prophet Muhammad’s birthday or known in Malaysia as Maulidur Rasul is the next religious festival and is celebrated with street procession, religious lectures and recitals of Quranic verses. This event falls in the Muslim month of Rabi’ al-awwal and since there are only 30 days in a Muslim calendar, the date for the event will therefore vary every year, on the Gregorian calendar. Although this practice started in Egypt in the eleventh century which then spread gradually to other parts of the Muslim world, not all Muslims will celebrate this event. Sunnis in Saudi Arabia consider this as heresy and do not celebrate the event. If cycling is your religion, then you are in luck! Le Tour de Langkawi is Asia's premier annual cycling competition and is a 10-stage event that spreads over a 10-day period. It is divided into four categories; professional, continental, regional and national. It used to start in Langkawi, but is now flagged off at different locations in Malaysia. The route changes every year, but it will always pass through several scenic spots and going through several demanding terrains. Now let's move on to some kid friendly event and go to Putrajaya International Hot Air Balloon Fiesta. With so many activities, you are guaranteed many thrilling moments for the rest of the day. 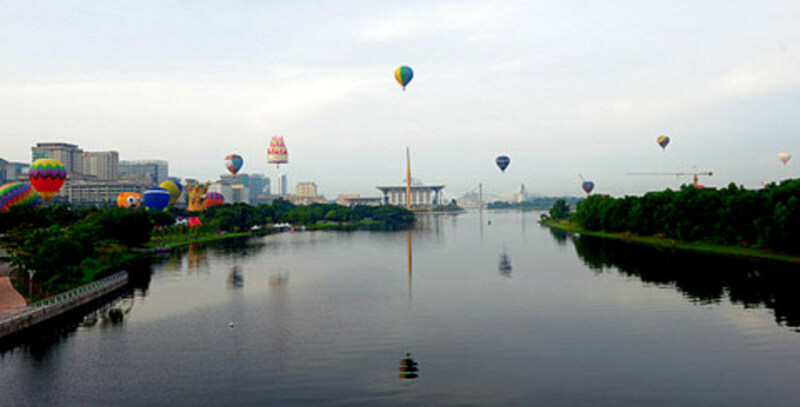 Putrajaya International Hot Air Balloon Fiesta started in 2009 with only 17 hot air balloons and in 2013, it attracted 24 participants from 14 countries. It has also grown to be one of the popular hot air balloon destinations in Asia. One of the highlights of the fiesta is the “night glow” event where the hot air balloons will light up in synchronized manner to the sound of music. 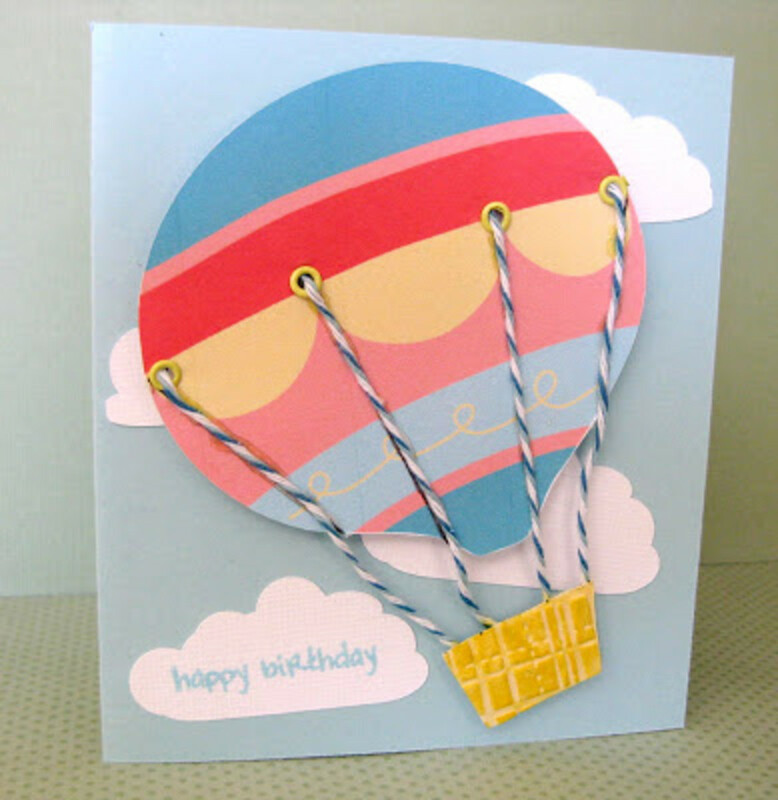 What made it more exciting are many colorful and creative designs and shapes of these hot air balloons. The whole day activities may be a bit tiring for the kids, but try to stay back for the great fireworks display that is held at the end of the event. This is a free entrance fiesta and it spreads over 4 days, and starts very early at 7am. If you want to go on the hot air balloon ride, come early and join the queue as tickets are limited. Other side activities which are payable are wall climbing, car simulator, Zorb Ball, KMX Bike, Paint Ball, Water Ball, Bumper Orb, Segway, Kids Orb, Archery, Tethered Hot Air Balloon, Meet and Greet the Balloonist and Helicopter Ride. With so many activities, the fiesta attracts a lot of visitors and car parking can be a hassle. It is best to take public transport instead. Do not forget to wear proper attire for outdoor activities and bring extra clothes as you may get wet. March will end with an adrenaline pumping Formula 1 event. 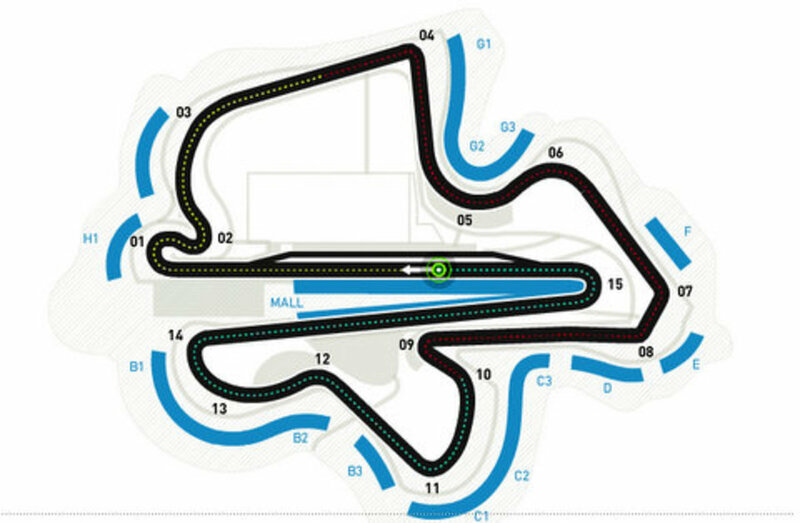 Designed by German designer Hermann Tilke, the Sepang F1 circuit has a fast flowing, but truly challenging layout that even all drivers swear that it is one of the most difficult circuits in the world. Coupled with the hot, humid, and wet condition, it makes this Formula 1 Grand Prix one of the most exciting races that test the skills of these world class drivers. This 'not to be missed' event is packaged together with paid and free entertainment and concert by international artistes and local artistes. This is in line with their promotional theme of shop, party, and race. If you are into F1, make a point to be here to witness the event, live! For something different, visit this traditional sailboat regatta in Semporna, Sabah. The Bajau communities, who were traditionally seafarers, built splendid boats and to commemorate this tradition, the state government held the Regatta Lepa (which means ‘boat’ in their dialect) in 1994. It has been an annual event ever since. Besides the race, other activities include most beautiful traditional sailboats competition and telematches. These are boat race, lepa tug of war, small dugout boat race (kelleh-kelleh), and duck catching competition. 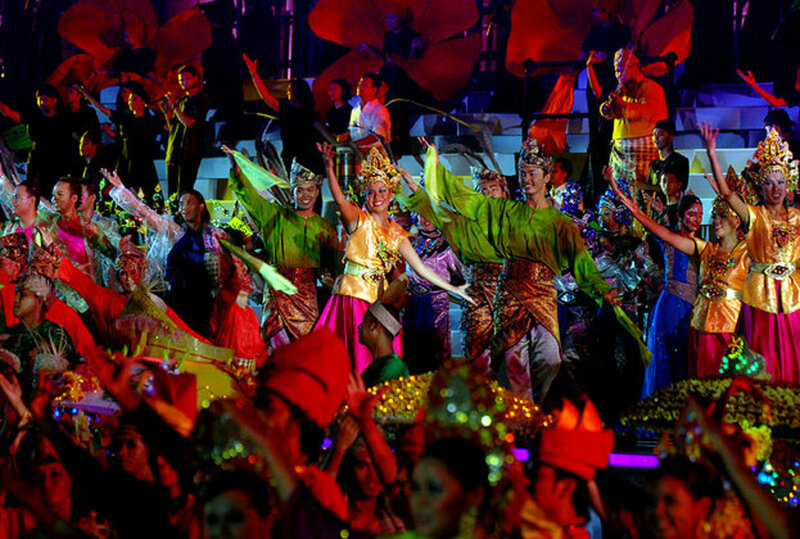 To end the event, a colorful cultural performance will be held at night; something that you should not miss. Malaysian Christians will celebrate Good Friday, the day Jesus Christ was crucified, with prayers in churches around the country. In some churches, services are held at 3pm, the hour in which Jesus Christ was said to have died. At the St. Joseph’s Church in Kuala Lumpur, a symbolic re-enactment of Jesus Christ's final hour is held before the services. Good Friday is an important event in the states of Sabah and Sarawak, and is declared a public holiday. 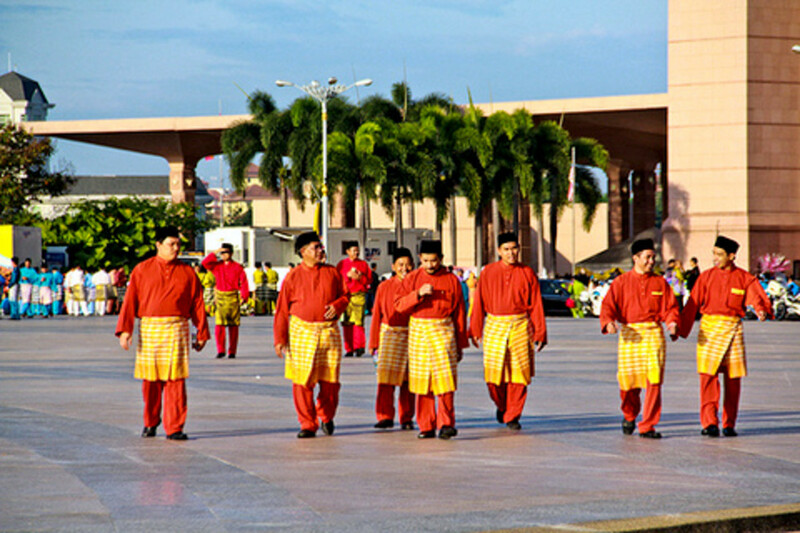 Sabah Cultural Festival is an event to showcase the state's cultural heritages that include performance of ethic songs, music, and dances from its 30 different ethnic groups. This cultural extravaganza will also have sales of local handicrafts, woodcarvings, local hand woven materials, and delicacies from these ethnic groups. 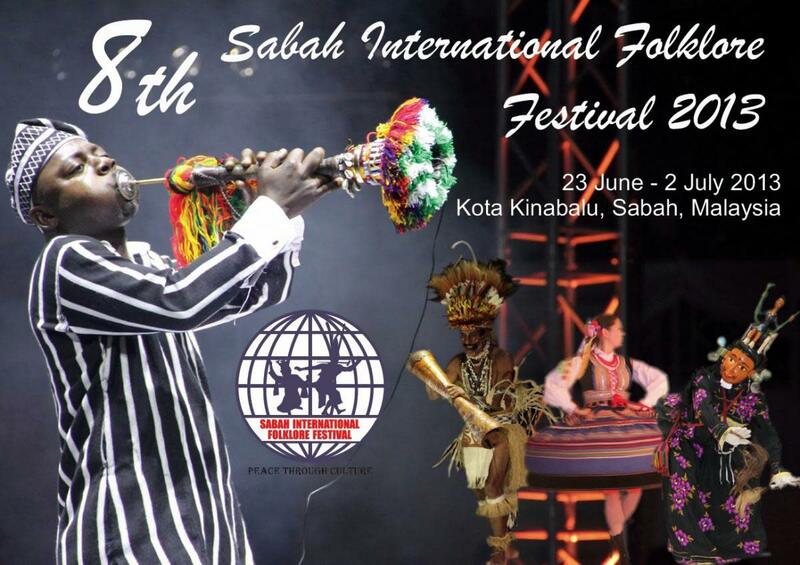 Visit this event if you want to understand the cultures and lifestyle of Sabah’s various ethnic groups. The organizer takes great pride in preserving the state's precious heritage and shares their appeal with visitors from other parts of the country and the rest of the world. 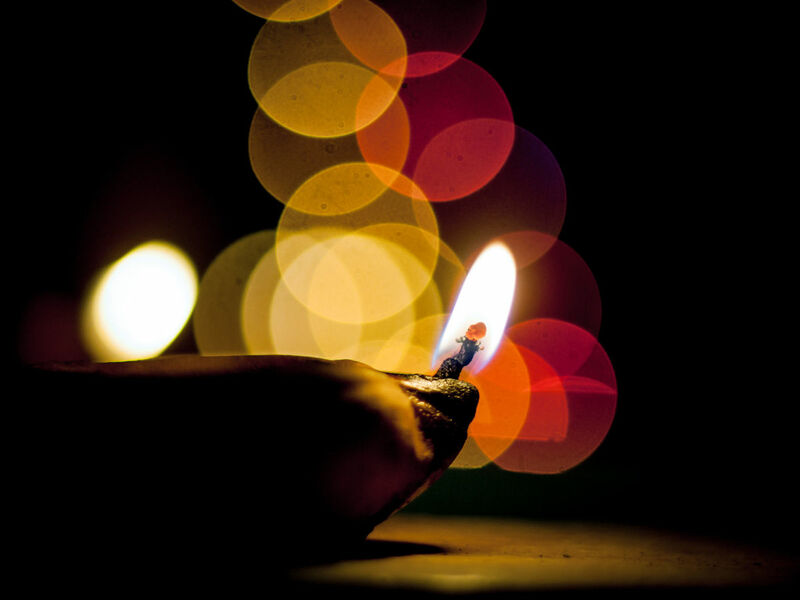 Wesak Day is celebrated by the Buddhist communities to mark three significant events; the birth, enlightenment and passing of Gautama Buddha. Devotees will gather at temples to offer flowers, lit candles and pray for blessings. They will release animals such as doves, as a symbolic gesture of giving up the past sins. The less fortunate is not forgotten as various charitable activities are held to assist them. In the evening, there will be a candle procession, but the most elaborate is the colorful Wesak Day float procession, held in Penang. This is Malaysia's premier cultural festival that celebrates the country’s multi-ethnic, multi-culture and multi-religion diversity. Also known as, Citrawarna, this month-long festival is filled with traditional performances, colorful parades, exhibitions and street performances and entertainment. For visitors, this festival is a free introduction and exposure to Malaysia's cultural diversities and is a celebration that had to be experienced. So, if you have only a short time to spend in Malaysia and are on a tight budget, schedule your visit during this festival period. Tadau Kaamatan is a harvest festival celebrated by the Kadazan Dusun community in Sabah. It marks the end of rice harvesting season, and an event to offer gratitude for a good harvest. In the past, this festival is deep in elaborate rituals. Now, since most of Kadazan Dusun communities have either embraced Christianity or Islam, most of the ritualistic aspects of Tadau Kaamatan are seldom practiced. The festival is celebrated instead, with just cultural dances, eating traditional delicacies, and drinking the traditional rice wine. Therefore, this festival means a lot of drinking and some will find this as an excuse to get drunk! Dragon Boat Festival is a Chinese ritual, steep in history that dates back over 2000 years. It started as an event to rid-off evil spirits, when diseases were common and spread easily during summer. It is now a key sporting event in China, Taiwan, Hong Kong, Singapore, Macau, and Malaysia. 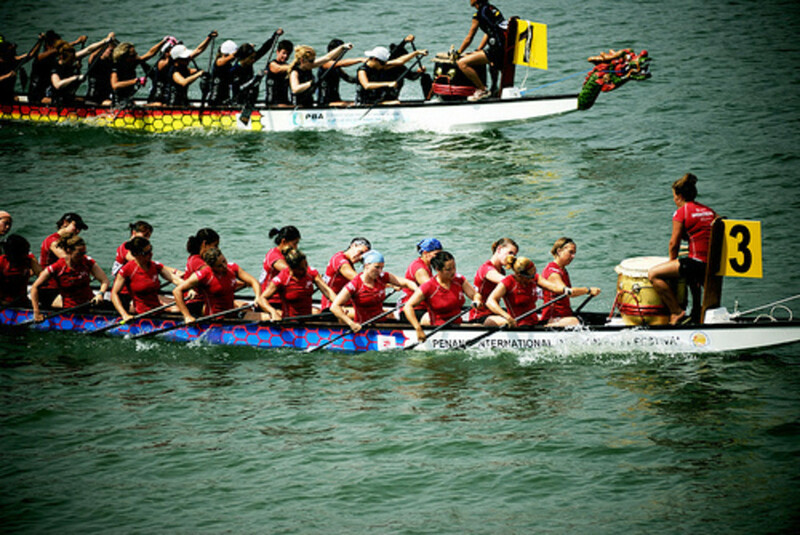 Penang host the biggest dragon boat festival in Malaysia and it has become an annual event that attracted many local and international participants vying for the prized trophy. In this dragon boat race, rival teams will paddle their colorful dragon-headed boats forward to the finishing line, to the beat of thumping drums. Do not miss this vibrant and colorful event and book your flight soon. 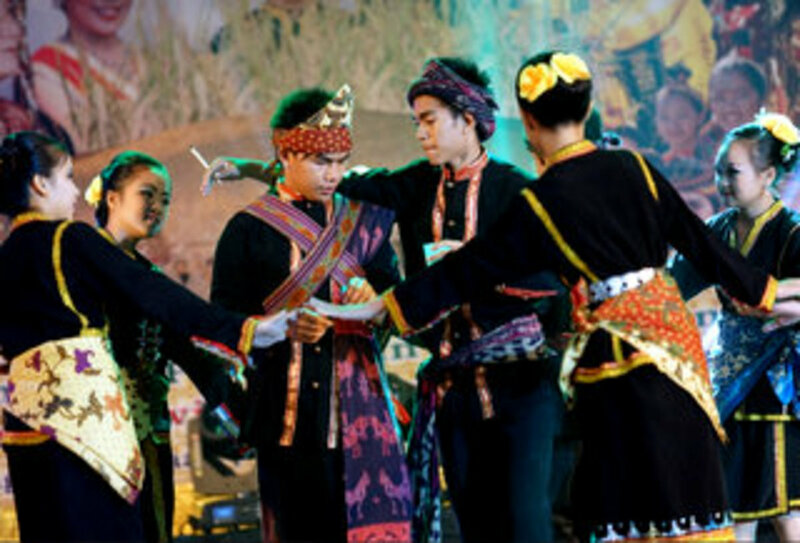 This is similar to Tadau Kaamatan, a Thanksgiving day for a good harvest, but celebrated by the Dayak communities in Sarawak. The festival will start with the offering ceremony where the chief will sacrifice a cockerel. Traditionally this will be at the longhouse ruai or common area, now it is also held in the community center. Although this is a religious event, it is also a social event to bring families and friends together, as well as paying respect to the elderly. George Town Festival is a month-long celebration to commemorate its recognition as a UNESCO World Heritage site. 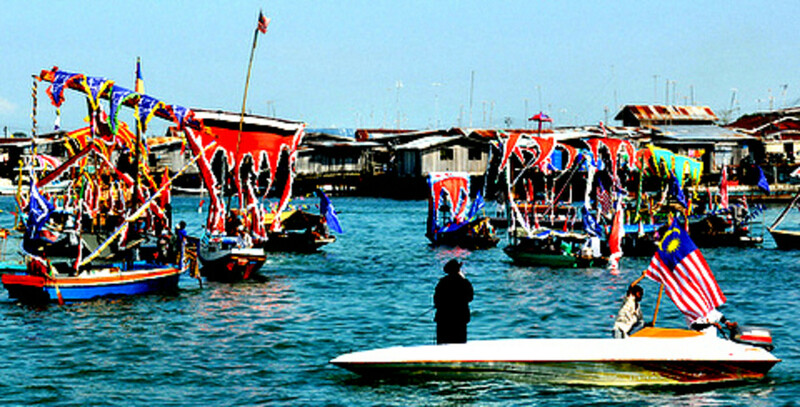 Held annually in George Town, Penang, this festival will showcase the island's diversified and colorful heritage. These are done through music, film, dance, arts, and food. This is the people’s festival and the organizer takes pains to make sure it is accessible and as interactive to the communities as much as possible. It will showcase works of local as well as internationally acclaimed talents. 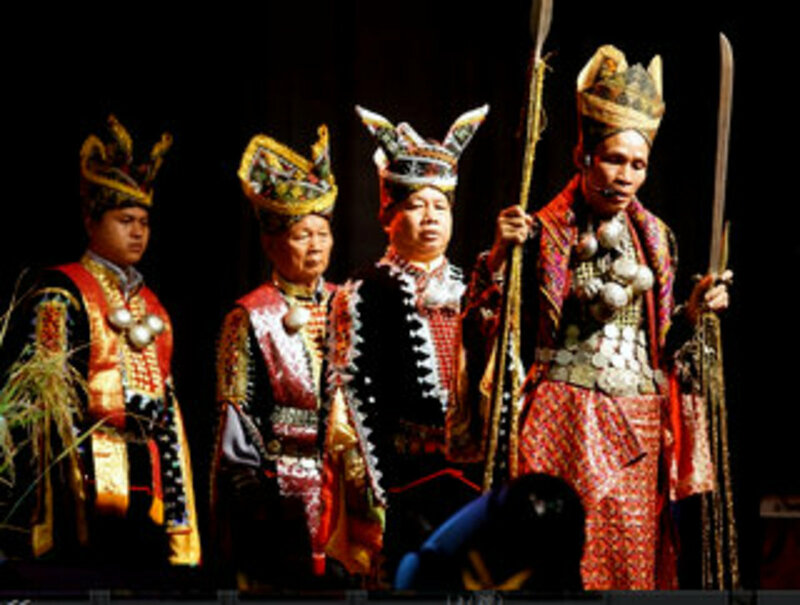 In line with its World Heritage site recognition, the organizer aimed to make the festival a showcase of traditional and endangered crafts and performing arts not only from Penang and other parts of Malaysia, but also from South-East Asia. Several events will be held “anywhere and everywhere” in Penang and you will have a busy time being entertained as well as being educated. Therefore, if you want a break from the museums, George Town Festival is an interactive indoor and outdoor 'museum' of Penang's heritage. The state of Malacca was occupied by the Portuguese for more than 100 years from year 1511 onward, before the Dutch came in and later, the British. 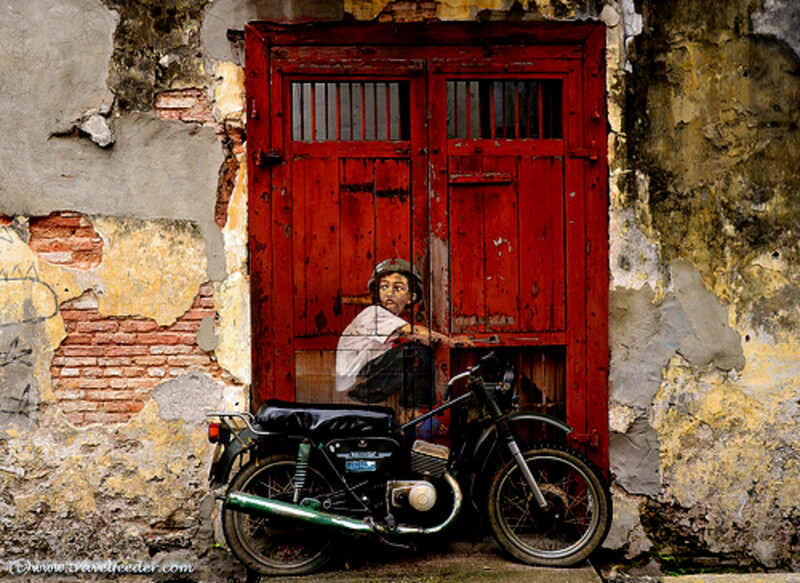 Despite the conquest by the Dutch, the Portuguese descendants stayed on in Malacca. To this day, these descendants with Portuguese surname still practices and celebrates its many religious and cultural festivals. Festival of San Pedro is one of them. This is a week-long celebration to celebrate the birthday of San Pedro, the patron saint of fishermen. Hence, fishing boats that are colorfully decorated will be blessed and prayers offered for a better harvest. To add color and gaiety to this festival, other activities that include fishing and best boat decoration competitions and traditional Portuguese cuisine cooking demonstration will be held. This is a 10-day event that will showcase the unique and beautiful cultural dances, folk songs and music by various ethnic groups from various parts of the world. Through this event, the state government of Sabah hopes to promote understanding and goodwill among participating countries as well as promote Sabah as a tourist destination. Simultaneously, a five-day Folk Art Exhibition will also be held to show the beauty and uniqueness of the various arts and handicrafts from the participating countries. So, if you are a culture enthusiast, this festival is one unique event that will allow you to see various cultural dances, hear various folk songs, music and arts and handicrafts from various parts of the world, all in one place. This wraps up the festivals, celebrations and events for the first half of the year. I hope you enjoyed reading this as much as I did writing it. Hopefully, this will spur your curiosity to come over and experience them yourself. There are actually more, but I highlighted only the major events. For events in the second half of the year, please visit festivals for July to December. Yes, malaysiaflights please do as our currency is weak at the moment. Hence, you get a better deal with your exchange rate. im gonna go Malaysia in Nov, this is some real grt info!! grt grt hub. 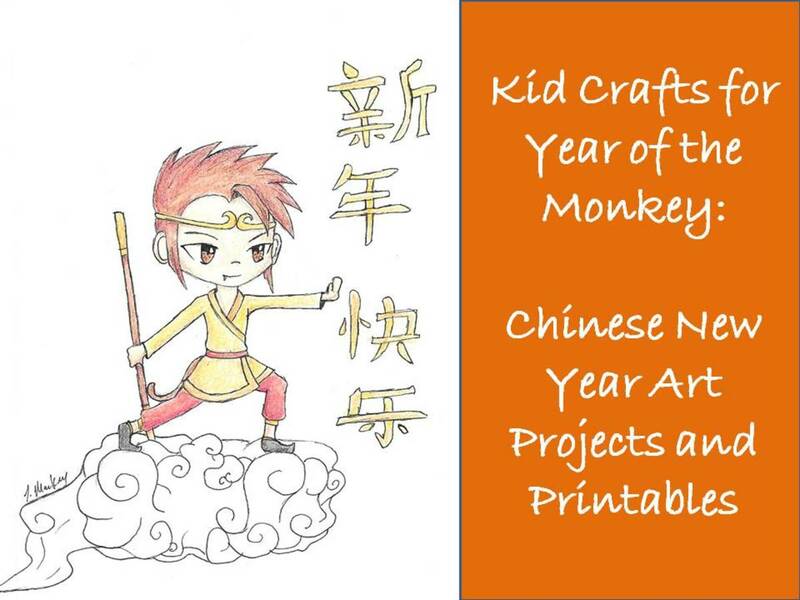 kidscrafts, parade takes a long time to finish and if the weather is cold, it isn't fun anymore. But then again, it is an experience and Chinese New Year parade is usually fun, noisy and colorful. Give it a try! You have a lot of things going on in your corner of the world. We have the celebration of the Chinese New Year but because it's usually so cold, I don't venture in the streets of Ottawa to see the parade. May be I should in 2014!